WORLDWIDE: Recent project updates from offshore projects around the world, including sites in the UK, Germany, Finland and the US. Base port: Eurogate Container Terminals Bremerhaven will be the base port for installation work at Wpd's Nordergründe. The container terminal operator has signed a contract with Senvion, the supplier of the 111MW project's 18 6.2M126 turbines. 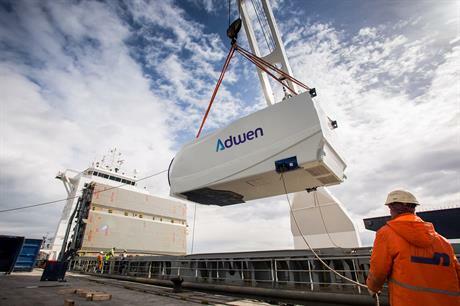 From April 2016, Senvion will lease handling and quay areas at the southern tip of the terminal, from where components will be shipped. Pre-construction surveys: Dong Energy has appointed Fugro to carry out pre-construction surveys at the site of its Walney Extension project in the Irish Sea. The 649MW site will comprise 40 MHI-Vestas V164 8MW turbines and 47 Siemens 7MW turbines across two phases. The surveys will help to ensure that the seabed is clear of obstructions, including unexploded ordnance (UXO). Fugro will use three of its specialist vessels. The Fugro Helmert will survey the main project site, while the RV Discovery will operate on both the wind farm site and the export cable route. Cable supplier: Dong has also contracted VBMS to install the 87 inter-array cables at Walney Extension. VBMS replaces CT Offshore, following the exit of its parent company, A2SEA, from the cable-laying business. Its scope of work will comprise route engineering, a pre-lay grapnel run, transportation, installation and trenching. Bill passed: The New Jersey Assembly has passed a bill that would boost the 24MW Fishermen's Atlantic City Windfarm (FACW) project in the US. The state Senate had already passed the bill, which would require the Board of Public Utilities (BPU) to open a 30-day window for applications for 20-25MW offshore wind projects. FACW's developer, Fishermen's Energy, has said it will resubmit the project to the BPU if it has the opportunity. The bill now goes to Governor Chris Christie for his signature or veto. However, in January he vetoed a similar measure. The BPU has previously rejected FACW, claiming it would be too costly for ratepayers. Project contractor: Developer Suomen Hyotytuuli Oy has appointed Jan De Nul Group as the main contractor for its 40MW Tahkoluoto project off Finland. It will be responsible for dredging, seabed construction work and the installation of foundations and turbines. The work will take place over the next two summers, commencing in April 2016. Construction start: At a ceremony at the Port of Sassnitz on the island of Rugen, Iberdrola has marked the official start of construction of its 350MW Wikinger project. Turbines take shape: Manufacturing of the 70 5MW turbines for Wikinger is under way, at Adwen's facilities in Stade and Bremerhaven. O&M support: Services specialist CWind has been contracted to provide technicians to support Siemens' operations and maintenance services at German offshore wind farms. Site assessment: The Bureau of Ocean Energy Management (BOEM) has announced its first step towards potential leasing of federal waters off California for commercial wind energy development. It has found that Trident Winds' unsolicited lease request for the Morro Bay floating project is complete. Cable ducts: Dong has contracted AMS No-Dig to design, supply and install three cable ducts for Hornsea Project One. The offshore export cables will be pulled through them and connected to the onshore cable, linking the wind farm to the grid. AMS No-Dig will utilise horizontal directional drilling (HDD) techniques, with the work scheduled to take place in 2017.